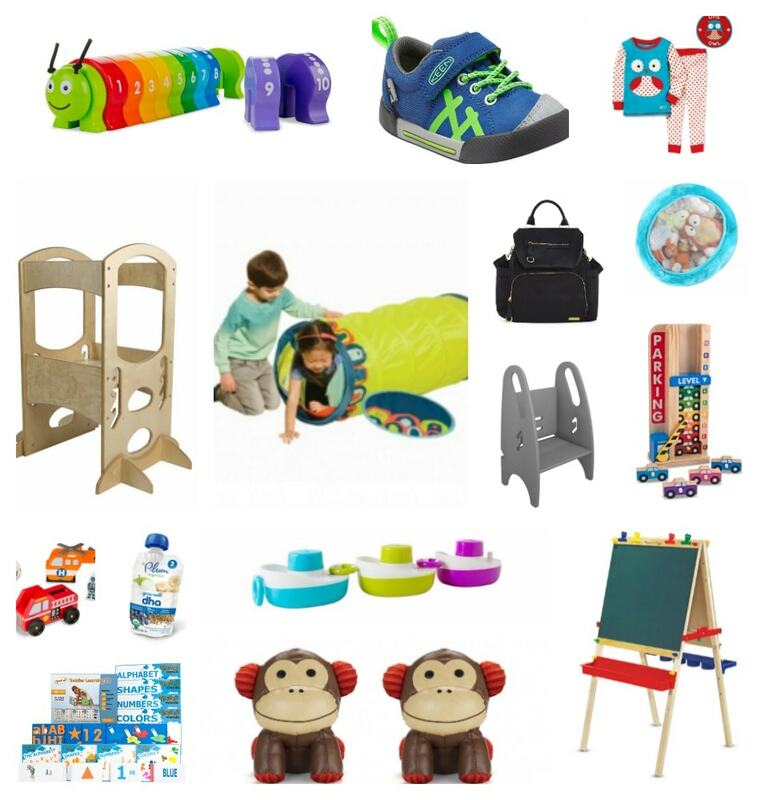 Jessica and Samantha here again with more must have gear for your developing toddler. We have tackled a lot of fun gear categories but it’s time for one of our favorites: must have educational gear. Toddlers grow and learn at an amazing rate so we’ve sought out and tested all of the best gear to help enrich your toddler’s developing mind and explore the world around them. Now that you’ve survived baby gear with Lady and the Blog’s A New Mom’s Ultimate Baby Gear Guide Part I, Part II, Part III, Part IV and Part V, it’s time to tackle the must-have toddler gear to make your life as a mom of an active toddler as easy and fun as possible. Previously we brought you A New Mom’s Ultimate Toddler Gear Guide, Part I: Eat, Sleep & Play, A New Mom’s Ultimate Toddler Gear Guide, Part II: Stroll & Travel and A New Mom’s Ultimate Toddler Gear Guide, Part III: Must Have Winter Gear. Now it’s time to help your toddler explore the world around them and feed their inquisitive mind with this roundup of fun, stimulating and educational toys and gear. Melissa and Doug is one of the leaders in educational toys for children of all ages and for good reason, their toys are impeccably made, well priced and incredibly user friendly. When I presented this toy to my toddler, he could hardly wait for me to open the package, and he hasn’t put the vehicles down since. At 3″ x 5″ x 18″ he loved how big the vehicles felt in his hand and the sturdy wheels have raced over every inch of our living room much to his delight. The removable wooden drivers have presented a great, attainable educational challenge as he fits the pieces in the vehicles and as we work on matching each driver to their corresponding vehicle. This toy has become a fixture in our home and I love watching my toddler explore it and develop his hands-on and imaginative play. The Melissa and Doug Emergency Vehicle Set retails for $19.99 and is designed for children 3 years and up. WHY WE LOVE IT: The large format vehicle are perfect for toddler sized hands and the bright colors and durable wood construction mean that the toys have a great feel and can withstand enthusiastic toddler play. As a bonus, the four drivers that fit inside add an age-appropriate puzzle element to this already engaging toy. Visit Melissa and Doug online to grab the perfect toy to jump start your little one’s play and imagination or visit them onTwitter, Facebook or Pinterest. Learning can sometimes be messy, but just because it’s bath time doesn’t mean your little one’s exploration and development has to take a break thanks to the baby gear geniuses at Boon. Boon has raised the bar on bath time with their two newest bath toys, Marco and Tones, that make the bath both fun and educational. The Boon Tones (pictured above, left and right) each have a whistle (low, medium and high) that play when tapped teaching cause and effect skills that your toddler initiates. Additionally the boats all have attached rings so little toddler hands can explore and link the boats together for more bath time fun. The Boon Marco (pictured above, center) is a deep sea explorer who bobs along the surface and has a color changing light that is activated by water. My toddler loves to drop his Marco in the water and pick him up again to see the light turn on and off and I can see the cause and effect wheels spinning in his brain as he washes off a day of exploring. Both the Tones and Marco are BPA, PVC and Phthalate free for worry-free play. The Boon Marco retails for $17.00 and the Tones retails for $17.99 for the set of three boats. WHY WE LOVE IT: Bath time is a great opportunity for development and sensory play and these toys from Boon tackle just that. With easy to grasp cause and effect results your toddler will be having so much fun they won’t realize they’re learning too. Visit Boon online to grab the perfect toys to make bath time fun and educational or visit them on Twitter, Facebook, Instagram or Pinterest. Colors, stacking and sequencing are three very important educational milestones for a developing toddler and the Counting Caterpillar and Stack and Count Parking Garage from Melissa and Doug are perfect for developing this whole range of skills. The Counting Caterpillar (above, left) and Stack and Count Parking Garage (above, right) both feature brightly colored wooden pieces that great for learning and exploring colors with your toddler. The Counting Caterpillar features numbered segments that allow your toddler to put the segments in numerical order along the caterpillar’s body or count the corresponding dots allowing them to both developing their counting and sequencing skills while exercising their fine motor skills. The Stack and Count Parking Garage exercises the same basic skills in a completely different format allowing your toddler to continue to learn in a new and exciting way. The stacking of the cars in the vertical garage exercises critical fine motor skills while sequencing and color matching skills are developed. A lot of skills packing into two toys, these will both keep your toddler engaged for an unbelievable amount of time while exploring critical developmental milestones. The Melissa and Doug Stack and Count Parking Garage retails for $19.99 and is designed for children 3 years and up and the Counting Caterpillar retails for $14.99 and is designed for children 2 years and up. WHY WE LOVE IT: Being space conscious, we love products that pull double duty and Melissa and Doug toys pack a lot of different educational skills into one toy. Each of these toys can be used to work on colors, counting, sequencing and different methods of stacking which means they will continue to grow and evolve as your toddler does all while making learning essential developmental skills a lot of fun. Visit Melissa and Doug online to pick up these amazing toys to help your little ones grow and learn while having fun doing it or visit them on Twitter, Facebook or Pinterest. Stuffed animals are great for developing security and imaginative play skills but very quickly your home may start to look like a zoo. Luckily Boon has got you covered with their Animal Bag that wrangles the stuffed animal zoo while keeping the beloved stuffed animals close at hand. Holding a generous amount of stuffed animals, the Animal Bag is the perfect solution for taming your stuffed animal menagerie. As a bonus, once filled, this fuzzy Animal Bag turns into a cuddly cushion for toddlers to climb on and play with. The Boon Animal Bag comes in orange, grey and teal and retails for $49.99. WHY WE LOVE IT: The simple zip top loading means that toddlers can be a part of cleaning up their stuffed animals and the mesh front means that they’ll always know that even when cleaned up their beloved animals are not far away. Visit Boon online to get your stuffed animal storage under control or visit them on Twitter, Facebook, Instagram or Pinterest. Books are an essential education item in every home, but as your little one’s book collection grows it can quickly become a mess that takes over your house. Fortunately, the baby gear genius at Skip Hop have come up with an adorable solution in their new Zoo Bookends. Each pair of fun weighted animal bookends is sure to amuse your toddler with their bright colors and soft faux leather. My toddler loves the responsibility of collecting bookend friends and his books to help me clean up after story time and the adorable characters make learning about cleaning up fun. Skip Hop Zoo Bookends come in Marshal Monkey and Otis Owl and retail for $35 for a set of two. WHY WE LOVE IT: These bookends are the perfect piece of gear to keep your little one’s favorite books handy and accessible and keep the nursery cleaner while looking adorable. A must have for all budding learners. Visit rel=”nofollow”Skip Hop online to get the perfect accessory to get your book storage under control or visit them on Twitter, Facebook, Instagram or Pinterest. Melissa and Doug finds themselves on this list once again and for good reason, their Deluxe Wooden Standing Art Easel was clearly designed with a lot of attention to detail by a parent and a must have item for developing toddlers and children. The Deluxe Wooden Standing Art Easel consists of a sturdy wooden frame and features a dry-erase board on one side and a chalk board on the other, two plastic trays for paint and supplies, an internal paper roll, 4 clips to keep paper in place and a child safe paper cutter. The Easel was incredibly easy to assemble and once assembled it can quickly be folded flat for easy storage. I love that this easel is easy to move and features several different mediums to keep creative minds busy and engaged. 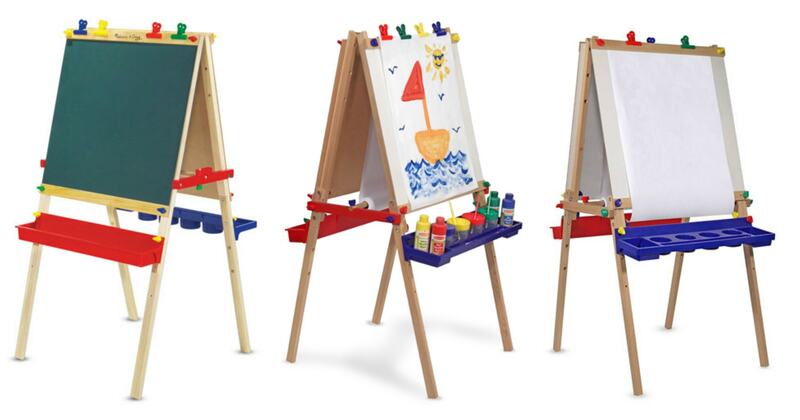 After trying several easels the Melissa and Doug was the clear favorite because of all the thoughtful details built into the design. I love that the paper roll fits in the center of the easel and threads through the frame making it easy to load (and re-load) paper as my little guy creates one masterpiece after another. As a bonus, the center loaded paper roll keeps him from unraveling paper in his explorations. The Melissa and Doug Deluxe Wooden Standing Art Easel retails for $79.99 and is designed for children 3 years and up. WHY WE LOVE IT: This All-in-One Easel can keep my little one entertained for an unbelievable amount of time. I love that it is easy to assemble and collapse and my little guy loves how many different ways he can color, paint and explore on it. A must have for budding Picassos who can’t wait to explore their artistic side. As a bonus, the easel is adjustable ad continues to grow with your child long past their toddler years. Visit Melissa and Doug online to pick up the ultimate art accessory to help your little Picasso create a masterpiece or visit them on Twitter, Facebook or Pinterest. When toddlers are ready to use their imagination and enter into a world of endless possibilities, B.Toys has just the set up for fun and creativity. Popping up in just seconds, the House-O-Fun is a fabric house with a detachable door to crawl in and out of. Add in the connective Tunnel-O-Fun for a greater adventure, and toddler begin to exercise in playful new ways, as they invent an alternate universe of the mind’s creation. The tent-like nature of the house and tunnel give little ones a space to call their own, inspiring excitement and interest without having to ever leave the home. The House-O-Fun retails for $19.99 and the Tunnel-O-Fun retails for $19.99. WHY WE LOVE IT: Perfect for tight spaces, the House-O-Fun and Tunnel-O-Fun is compact in its storage, and pops open with ease. Another plus, the fabric construction lends well to spills and accidents, with a wipe-clean surface that won’t leave a trace. Visit B. Toys online to grab the perfect play tunnel accessory. Perfect for familiarizing little ones with the alphabet, shapes, colors and numbers, the Teach My Toddler Learning Kit puts the fun in learning. The kit includes 4 board books on each subject, 4 posters, 7 puzzles and 55 flashcards with which to introduce your toddler. 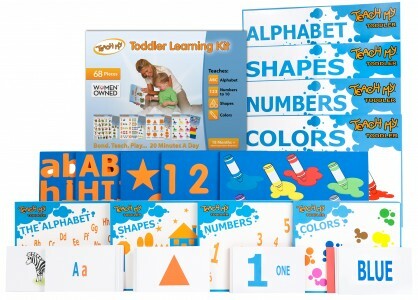 Promoting literacy, spatial reasoning, numeracy, recognition, hand-eye coordination, and fine motor skills, this kit has it all to get your toddler started. With just 20 minutes each day using and playing with Teach My Toddler, youngsters develop an early appreciation and love for learning. The Teach My Toddler Learning Kit retails for $29.99. WHY WE LOVE IT: The comprehensive kit includes a lot of resources, but its briefcase packaging keeps it all organized and together. With so many components to offer for the young learner, the Teach My Toddler Learning Kit recognizes that there is no “one size fits all”, and offers something for every child to be captivated by and engaged with. Visit Teach My Toddler online to grab the ultimate educational tool for your developing toddler or visit them online on Twitter, Facebook, Instagram or Pinterest. 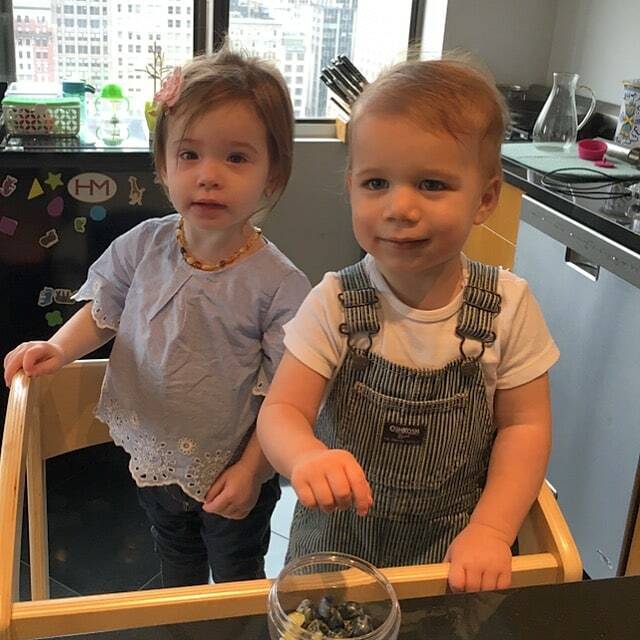 Preparing meals while entertaining a toddler is always a challenge but Little Partners has solved this challenge and made meal preparation a family affair with their amazing Learning Tower. I can honestly say, I don’t know who likes the Learning Tower more, me or my toddler. I love that the Learning Tower brings my toddler up to the counter with me and makes it easy to keep him engaged and in eyesight while I prepare meals, and my toddler loves that he is now a part of the action when it comes to meal preparation. I love that the wide platform allows my toddler space to move around while safely protected in the 4 sided framework of the Learning Tower. The genius construction design also includes footholds on the side of the tower allowing my toddler to climb in and out of the tower unassisted. The sense of independence this gives him, while still keeping him safely up to the counter and secure means that I can keep him close and safe while still engaging in essential tasks like meal prep and emptying the dishwasher. As an added bonus, because the cooking is now taking place on his level my toddler now enjoys engaging in his own age appropriate tasks during meal preparation allowing him another avenue to learn and develop while I get essential tasks done in the kitchen. The four sided frame of the Learning Tower provides a safer space for my toddler than a traditional step stool and the solid wood construction and and adjustable platform means this product can grow with your toddler from 18 months to 6 years old. The Learning Tower has been tested to hold up to 500 pounds and is easy to clean with a damp cloth. The Little Partners Learning Tower comes in 7 colors and retails for $199.99. WHY WE LOVE IT: This one piece of gear has meant the difference between takeout and home cooked meals in my home! By bringing my toddler up to the action, meal preparation has become another educational experience and an invaluable time to bond while preparing meals. As a bonus, the easy adjustability means this tower will continue to grow and adapt with my growing toddler. Visit Little Partners online to get the kitchen learning tool that will help your little one learn while giving you free hands in the kitchen or visit them on Facebook or Pinterest. As you fuel your developing toddler’s mind, it’s important to remember to fuel their bodies as well and once again Plum Organics has exactly what you need to feed your toddler’s inquisitive and expanding palate while helping eat their way to their healthiest self with their new line of Grow Well Pouches. As with all Plum Organic products, the Grow Well pouches are made from all certified organic ingredients, contain no sweeteners, no genetically modified ingredients and come in four profiles: Bone, Tummy, Muscle and DHA. The pouches each focus on different ingredients to help toddlers reach their full potential. Plum Organics Grow Well Pouches prices vary by retailer. WHY WE LOVE IT: Feeding a growing toddler while on the go can be a challenge but throwing some Plum Organics Grow Well pouches into the diaper bag makes it a whole lot easier. Even better, while toddlers enjoy the range of Grow Well flavors, you get the satisfaction of knowing that they are eating organic ingredients and getting essential vitamins to feed their growing and developing bodies. Visit Plum Organics online to pick up the perfect snack to fuel your busy toddler or visit them on Twitter, Facebook or Pinterest. Potty training and self care is a major educational milestone for toddlers and their parents and having the right gear makes this big educational jump even easier so we were so excited to find the Little Partners 3 in 1 Growing Step Stool. The solid wood construction and 3 position adjustable heights means that this step stool is a secure and adaptable way to help your toddler as your enter the “do it myself!” years of education and development. One of my toddler’s favorite parts of the potty training process is washing his hands and the freedom to climb up and access the sink himself gives him essential independence as he is developing his potty training and self care skills. I love that the step stool is easy to move from room to room making post-meal hand washing another opportunity to learn independence and self care skills and giving my toddler a forum where he is allowed to safely climb has helped to deter him from climbing on furniture that is not safe. The Little Partners 3 in 1 Growing Step Stool comes in 7 colors and retails for $129.99. WHY WE LOVE IT: Always space conscious, we love that this 3 in 1 Step Stool grows with your child and easily adjusts so it is perfect to keep up with your growing toddler as the develop and learn essential self-care skills. Additionally the beautiful design and range of colors means that it is easy to find just the right one to complement your bathroom or kitchen so your home can continue to look beautiful while your toddler learns. Visit Little Partners online to grab this must have accessory for toddler independence or visit them on Facebook or Pinterest. Learning and developing toddlers are always on the go so great footwear is an essential, and Keen has got you covered with the Encanto Sneaker. Coming in True Blue (above, left) and Purple Heart (above, right), these shoes are as adorable as they are durable. I love that the adjustable strap and streatchy laces and loop at the heel make it easy to put these shoes on a wiggly toddler who’s excited to go outside and the natural probiotic provides odor control so no matter how much my little man runs around there’s no fun to follow us home. As a bonus, because these sneakers are so easy to put on, they are a great opportunity for toddlers to learn self care skills and working on putting on their shoes themselves. The Keen Encanto Sneaker comes in sizes 4-7 and retail for $50. WHY WE LOVE IT: Adorable, durable and easy to put on, what more can you ask for in a great pair of kid’s shoes? Visit Keen online to get the perfect shoes to keep your toddler on the move or visit them on Twitter, Facebook, Instagram or Pinterest. While your developing toddler is on the go, so are you so a functional diaper bag that can keep up with your busy life is a must. Enter the diaper bag gurus at Skip Hop who have found a way to keep the diaper bag functional and very fashionable as you chase after an active toddler. I love the look of the metal hardware and faux leather details on the Chelsea Downtown Diaper Bag that wipe clean and stay looking great no matter where your adventures take you. But more than a pretty face, this diaper bag has lots of functionality. The expandable drawstring opening makes it easy to access the contents and the multitude of features include storage compartments galore, and external zipper pocket large enough for diapers and wipes, bottle pocket and an easy wipe-clean liner. The is definitely a go anywhere bag ready to contain whatever your adventures of the day hold. As a great bonus, I love that this bag hangs neatly on any stroller thanks to the attached stroller clips. The Skip Hop Chelsea Downtown Diaper Bag come is black and retails for $100. WHY WE LOVE IT: This bag’s functionality is only surpassed by how fashionable it is. The perfect bag without looking like a traditional diaper bag means that I can keep up with my toddler and look cute doing it. Visit Skip Hop online to get the ultimate diaper bag to look stylish while chasing an active toddler or visit them on Twitter, Facebook, Instagram or Pinterest. After a long day of learning and exploring, your toddler is sure to be exhausted, but just because it is bedtime doesn’t mean the fun and exploration has to end thanks to Skip Hop’s new line of Zoojamas. Coming in five fun animal designs: Owl, Butterfly, Dog, Monkey and Bee, the Zoojamas are adorable and incredible cozy and one last chance for your toddler to sneak in some learning and animal sounds at the end of a long day. Skip Hop Zoojamas come in sizes 2T-6 and retail for $25. WHY WE LOVE IT: As cozy as they are cute, the Zoojamas are the perfect thing to get your toddler excited for bedtime after a long day of learning and exploring. The scratch free tags, snug fit and incredibly soft cotton only makes us sad that they don’t come in our size too. Visit Skip Hop online to get the perfect pajamas to keep your little one cozy at the end of a long day or visit them on Twitter, Facebook, Instagram or Pinterest. A New Mom’s Ultimate Baby Gear Guide, Part V: Planes, Trains & Automobiles. Written by Samantha and Jessica with review help from our official gear testers Penny and Noah. Samples provided for review. Opinions expressed solely ours.